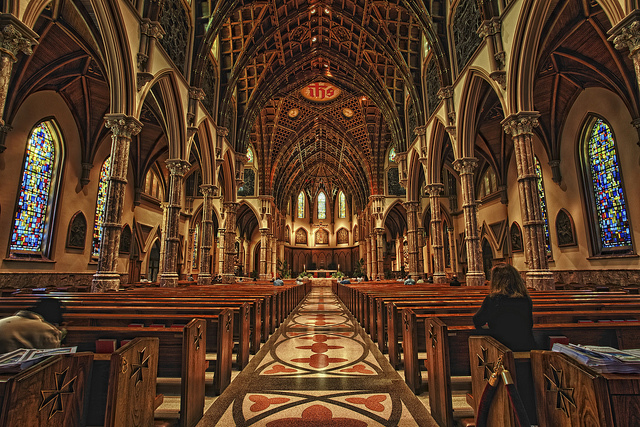 Were there too many empty pews in your church last weekend? Just what was everyone else doing while you were at Mass? A great resource for understanding what Americans do is the American Time Use Survey (ATUS), which is conducted by the Census Bureau and the Bureau of Labor Statistics. We’ve previously used ATUS and other similar studies to look at generational differences in religious practice over time. The ATUS interviews respondents from a large, nationally representative, random sample of households (more than 26,000) over the course of a year. Respondents are asked how they spent their time the day before they were interviewed (from 4 a.m. to 4 a.m.). The survey inquires as such: “So let's begin. Yesterday, at 4:00 AM, what were you doing?” The duration of activities are recorded and the day and night is filled out. Respondents can and do indicate that they multitask (i.e., do more than one thing at a time). The advantage of conducting a time use study is that the research is not directly inquiring about activities. So respondents are not asked, “Did you go to religious services?” (…when asked directly by Gallup, about four in ten Americans say they’ve gone to religious services in the week prior to being interviewed). In the ATUS, church attendance is only recorded if the respondent brings this up. This creates more accurate estimates of what people are actually doing (something we’ve covered before: 1, 2). The table below shows the ATUS results for 2013 for what Americans (ages 15 and older) did on Saturdays and Sundays combined (…note this includes people of any religious affiliation or no affiliation). Nearly four in ten hours of the day on a weekend (38.9%) is spent asleep (an average of 9.34 hours per day). Nearly all Americans report time spent on leisure activities (e.g., socializing, relaxing, using entertainment content) on the weekend, averaging 5.73 hours per day (24% of weekend time). Of this weekend leisure time, 60% is spent watching television (2.57 hours per day). The only other activity that nearly all Americans report doing is eating and drinking and this takes on average, 1.21 hours per day on the weekend (5% of weekend time). One in five Americans works on the weekend (20.7%). Of those who do so, they spend on average 5.48 hours per day on the job. In CARA’s national surveys of adult Catholics we ask respondents for reasons that explain why they have missed Mass. Work is one of the top reasons cited (also illness). After sleeping, leisure activities, eating and drinking, and work (for some) there is a scattering of other things done more frequently, on average, than religious or spiritual activities. These include: grooming (74.7% engaging for an average of 0.9 hours), housework (35.5% engaging for an average of 1.82 hours), food preparation and cleanup (53.7% engaging for an average of 1.18 hours), consumer goods purchases (42.2% engaging for an average of 1.17 hours), sports, exercise, and recreation (18.8% engaging for an average of 2.18 hours), caring for and helping children in the household (17.5% engaging for an average of 2.12 hours), and travel for leisure and sports (39.3% engaging for an average of 0.8 hours) or for purchasing goods and services (42.4% engaging for an average of 0.72 hours). 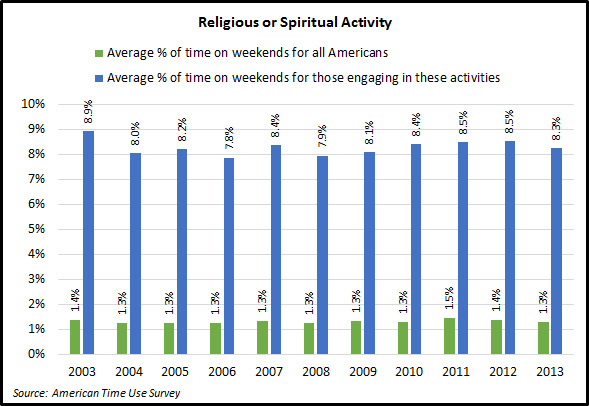 On average, Americans spend 0.31 hours per day on the weekend engaged in religious and spiritual activities (1.3% of weekend time). Note again this includes those of all (or no) affiliations and time on both Saturday and Sunday. Overall, 15.5% of Americans report a religious or spiritual activity and of these people, an average of 1.98 hours per day is spent on these activities (8.3% of their weekend time). As shown below, there is very little change in the percentage of time spent on religious or spiritual activities over the last decade. Americans have not become any less religious or spiritual in the things that they do since data collection began in 2003 (…don’t expect to ever read that in a newspaper as it doesn’t fit into the current “narrative” but it is in the data for anyone to see). These religious or spiritual activities include things like attending a variety of religious services, prayer, meditating, reading or studying religious or spiritual texts, religious education, conducting religious rites in the home, evangelizing, religious or spiritual food preparation, religious or spiritual singing, retreats, visiting graves, or cleaning up after religious services. 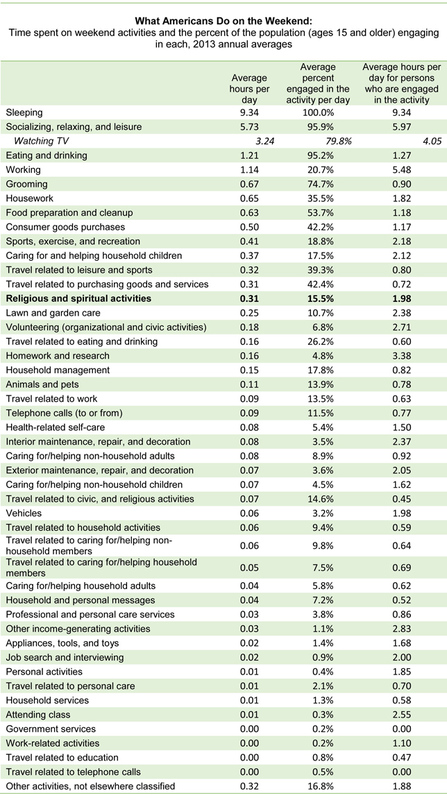 Americans spend more time, on average, doing religious or spiritual things on the weekend than lawn and garden care, volunteering, homework or research, caring for pets, home repair, or vehicle-related activities. Only 6.4% of Americans report religious or spiritual activities on a weekday. Of those who do, an average of 1.17 hours is spent on this per day. Perhaps the ATUS data can also reveal the biggest “competitor” for time facing religious and spiritual activities. As Robert Putnam identified in Bowling Alone (2000) the one technology that appears to be the most efficient for “consuming” more and more of our time continues to be television. There is likely more than enough space for religion and spirituality alongside shopping and exercising. Working, eating, sleeping, and grooming are all relatively inescapable. Yet, it is difficult to imagine that television (...as much as I love it) is an “essential” for anyone. It is true that one could watch religious and spiritual content on television. However, CARA’s multiple surveys on this topic reveal this is not a common activity by any means (1, 2). The channel is more often tuned elsewhere. More importantly the ATUS does not code viewing religious or spiritual content as “watching TV” and instead places that time under religious or spiritual activity. Whether weekday or weekend, more than eight in ten Americans watches television. 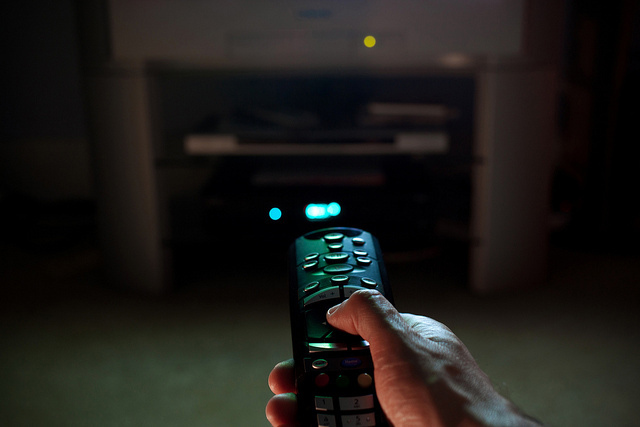 The average TV watcher consumes more than 24 hours of television per week! Before televisions invaded our living spaces that would have been a whole day every week that we would have spent doing something else (e.g., bowling in a league, visiting neighbors, going to PTA meetings, spending time at the lodge, playing with the kids outside). Over the last decade it has become so much easier to watch television. From cellphones to flat screens, on traditional networks or cable to streaming services—video content has never been so accessible. And the data reveal Americans continue to have a growing appetite for this content. In 2003, the average TV watcher (i.e., most Americans) consumed 23 hours per week. In 2013, the total had grown to 24.4 hours per week. As television becomes easier to consume almost anywhere and anytime, many brick and mortar membership institutions (including Catholic parishes) are gradually losing their ability to compete for time and attention against video content (from two-minute clips to full-length films). Catholic parishes must be able to make the case that Mass is more important and more interesting than a Game of Thrones streaming marathon or an NFL game. One would think that the former should be evident to any self-identified Catholic. However, CARA’s national surveys show many Catholics do not think missing Mass is a sin or at least not a sin that will lead to negative consequences. Monthly attendance is becoming a norm among many Catholic sub-groups. Making the case for “more interesting” can be a bigger challenge. One avenue may be to join in and do more religion on television, Netflix, YouTube, etc. Get people interested in their faith with good video content and maybe they will be more inclined to create that weekend space for religion and spirituality in a parish. Images courtesy of Chris Smith and Chris Brown. This year marked the 200th Anniversary of the restoration of the Society of Jesus by Pope Pius VII in 1814. The first 150 years of the restored Society saw a steady increase in the number of Jesuits across Europe and the Americas and the beginnings of an indigenous Jesuit population in Asia, Africa, and Latin America. The most recent 50 years show a reversal in the pattern of growth and expansion of Jesuits as India replaces the United States as the largest national group, and Asia and Africa experience steady growth compared to the declining numbers in Europe and North America. The changing number of Jesuits is driven by three factors: the number of men entering the novitiate each year, the number of men departing the Jesuits each year, and the number of Jesuits that die each year. A steady growth in the number of Jesuits is usually due to a consistently larger group entering year after year and a smaller group dying each year. A steady decline is usually the reverse of these two factors. Since the number of entrances or deaths can vary quite a bit year over year this study examines the data in 5 year blocks in order to smooth annual variances. The graph below shows the total number of Jesuits at five year intervals (1988, 1993, 1998, 2003, 2008, 2013) over the past 25 years. Both Africa and South Asia show a steady increase in numbers, and East Asia has a small decline. The Jesuits of Latin America have a steady decline in numbers, and the Jesuits of the United States and Europe have a much sharper decline. 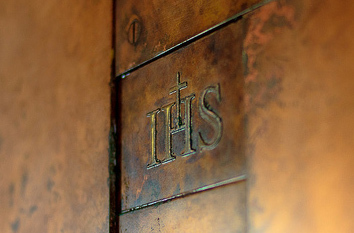 Europe and the United States have about one-half the number of Jesuits as 25 years ago. 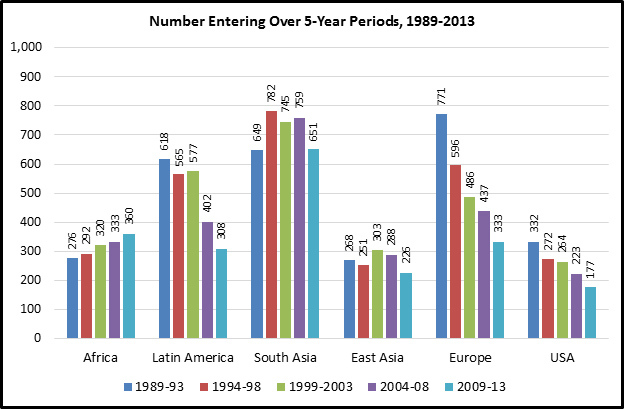 Twenty-five years ago the largest number of entering novices were in Europe followed by South Asia and then Latin America. The United States, Africa and East Asia each had smaller numbers entering. Over the years the number entering declined in Europe, Latin America and the United States while the number entering in South Asia and East Asia fluctuated. Only Africa saw a continuous increase in new novices. The sharp decline in the number of entering novices, more than 50 percent, in Europe, Latin America, and the United States accounts for almost all of the decline in entrances. The rest of the world is relatively stable or growing. In 1988 Europe, Latin America and the United States had 59 percent of all the entering novices and by 2013 this had declined to 40 percent. On the other hand, South Asia, East Asia and Africa went from 41 percent to 60 percent of the entering novices. The clear majority of younger Jesuits are now coming from Asia and Africa. In a pattern that is typical for all religious institutes, a large number of the men who enter the Jesuit novitiate later leave, usually during the years of formation before ordination or final vows. In general the pattern of departures follows the earlier pattern of entrances for each region of the Jesuits. There is a sharp decline in the number of departures over 25 years in Europe and the United States, and more recently in Latin America. 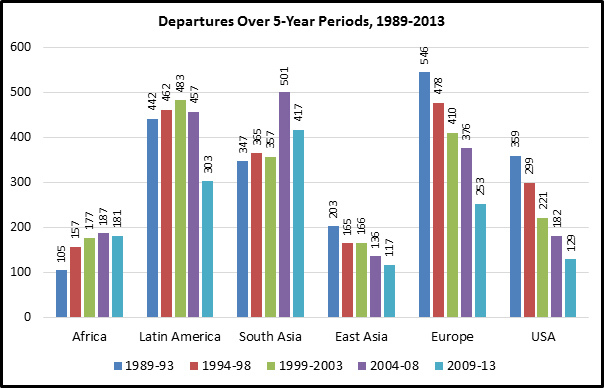 There are fewer departures in East Asia and an increase in departures in Africa and South Asia. The sustainability of the membership of a religious community relies on their being more entrances than departures over the course of years. 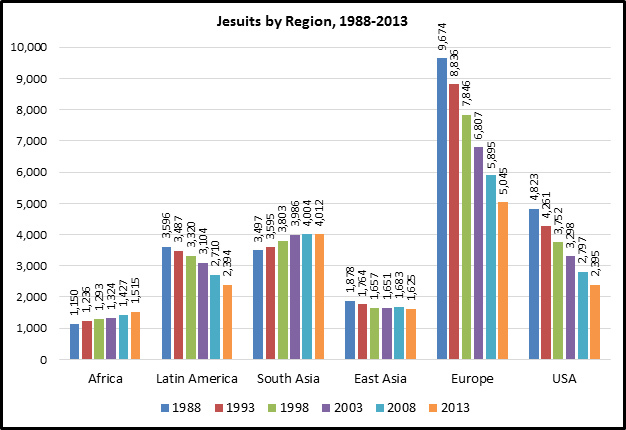 The graph below shows the gain or loss for each region of Jesuits in five-year periods over the past 25 years. South Asia and Africa have had large gains in members in each period of time. East Asia has shown a smaller but increasing gain, and Europe a diminished but stabilizing gain. 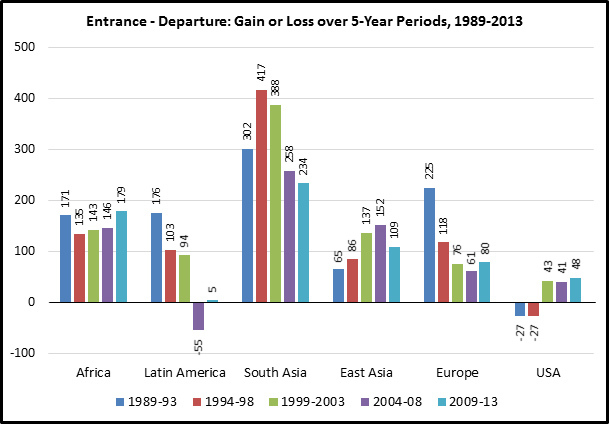 Latin America and the United States have shown periods of a loss of members (more men departing than entering over a five-year period), although both are showing a net gain in recent years. The vast majority of older Jesuits who entered prior to 1960 are in Europe and the United States, and there are fewer older Jesuits in Africa and South Asia. The Jesuits in Europe and the United States have consistently accounted for about two-thirds of all the deaths over the past 25 years while their proportion of the overall Jesuit membership has gone from 60 percent to 44 percent. When the number of men leaving the Jesuits is subtracted from the number entering and then the number of deaths are subtracted from that figure, we have the net gain or loss in Jesuit membership. In combining these three basic demographic elements we see clearly the large and continuous impact of the declining membership in Europe and the United States, and to a lesser extent Latin America. 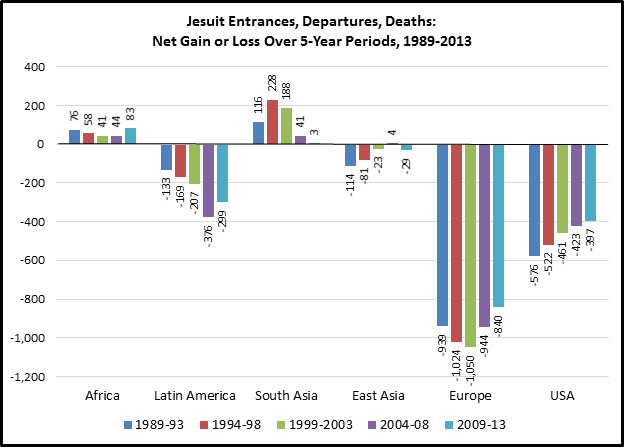 Only Africa and South Asia record any net gain in Jesuits year over year, and that gain is dwarfed by the losses of Europe and the United States. While Africa and South Asia may have a net gain of 100 to 200 Jesuits over a five-year period, Europe and the United States have a net loss 1,200 to 1,300 Jesuits. 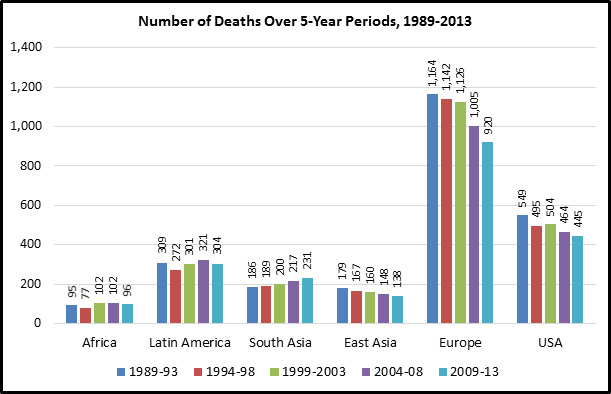 The greatest contrast in Jesuit demography among the regions of the world is the number of deaths. The large number of elderly Jesuits in Europe and the United States dying each year is the dominant factor in the changing Jesuit demography. Around 2000, the Jesuits of South Asia out-numbered the Jesuits of the United States and it is expected that South Asia may out-number Europe by 2015. As Jesuits gather in 2016 for a General Congregation and to elect a new Superior General, the demographic center of the Jesuits will be in South Asia and the global South. Image courtesy of Ilho Song.